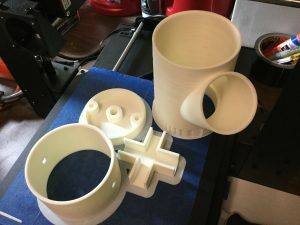 The 3D G-Tower (GT3x3/GT3x4/GT4x4) model files will be provided in STL format for a one-time fee of $100 (US) as part of your support license and will include updates to the GT series for life as well as direct support and guidance here (and optionally via Google Hangouts as a level 3 subscriber here). Since these files are too large for email attachments, you will receive a link to your very own shared Google Drive folder where your files will always be stored and updated. STL files are only useful in 3D printing, not injection molding. A separate license and contract will be required if you are wanting to put my work into injection molding production. This support license is exclusively for helping you build and implement these 3D printed garden towers. STL files have hidden identifiers in them showing your invoice number. Any proven report of your STL files being shared will result in termination of your support license, including all future updates. These files are tools that I provide as part of your support license and are for personal use only. Whatever you do with your 3D printed items themselves is totally up to you. Again, this is the purchase of a support plan, not a purchase of 3D models. The models are merely provided as a tool in the support plan so you can build the same towers that I use in my greenhouse. There are plenty of unsupported and untested models out there. The 3D G-Tower design is actually tested, supported, actively used in my own greenhouse and in other systems around the world. Warranty and return policy: All sales are final, support licenses are not transferable and not refundable due to the nature of electronic delivery of digital goods. All 3D printed goods sold on this website are custom orders and are not returnable. Digital goods are only guaranteed to take up hard drive space and 3D printed goods are only guaranteed to take up physical space. Placing an order on this website constitutes your agreement with these terms.